Last year the Martin Luther King Jr. Memorial construction made going to the Tidal Basin memorials from the Lincoln Memorial confusing, but now that it is a memorial to walk through to get to the Tidal Basin path. We came from the Washington Monument and entered between the two big rock shapes, which is the same way you would come from the Lincoln Memorial. However, if you came from the Tidal Basin, such as from the FDR or Jefferson Memorials, than you would first see the Martin Luther King Jr. statue part of the memorial. 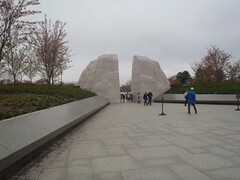 The MLK Memorial includes walls stretching out on both sides from the rocks and center path. The walls have quotes from speeches. In the center of the Memorial is another giant stone. 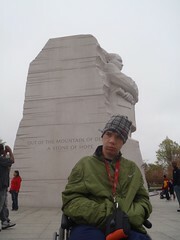 It seems just like another stone from the way we came in, but as you get to the side of it you will see that on the other side is Martin Luther King Jr carved out of it. On one side it says "Out of the mountain of despair, a stone of hope." The MLK Memorial is now the newest of the many memorials worth seeing in the National Mall area, but the part Mik loved the most was the bookstore and restrooms building. Like many of the bookstores and monument doors in the area, it does have button operated automatic doors. The part that most impressed Mik, though, was that it was the first time he had seen the buttons used for the bathrooms. 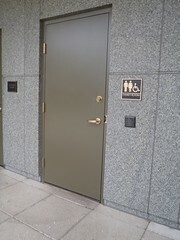 Mik especially appreciated that there was a Family Restroom and even it had a button outside and inside, although it was a little on the small side and would have been somwewhat difficult to go in there with him in his power chair. Still it is adequate and much better than the older facilities in the area. 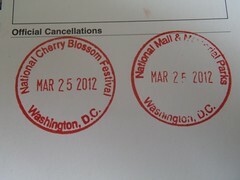 Also, in the Martin Luther King Jr Memorial Bookstore we got 3 more National Park Passport stamps. The first one we got was the Martin Luther King Jr MEM one, which filled up the last spot in our National Capital Region section of our 25th Anniversary Passports. The way I do it we fit 40 stamps on the 5 pages with 13 of them being from last year's visit when we first bought them after forgetting our original passports at the hotel the day we did the memorials. This time I did not forget those ones and the extra 2 at the MLK Jr Memorial (National Cherry Blossom Festival and National Mall & Memorial Parks ones) are the first ones in the National Capital region of those passports. I was really excited about doing those stamps in mine because now my passport has a stamp in each region. I started my original one in 2007 and after the ballpark trip in 2009 I had stamps in all regions except the National Capital region. It was driving me nuts that I did not have any in that region, especially since I lived in the DC area between September 2007 and April 2008. Not to mention I could have gotten some on the ballpark trip, but did not think of it at the time. Mik only got his original in February 2011, so he only has one Western region and now 2 Capital region stamps in his original. In the 25th Anniversary ones we do not yet have any from the North Atlantic or Southwest, although this summer we will hit some in the Southwest region.